When rif and I were in Singapore, we made it a point to try Tony Roma’s and Carl’s Jr (for the pork). We went to Carl’s Jr at Far East Plaza, which was pretty packed with patrons, at 5pm. Since it was too close to dinner time, we shared a set – Guacamole Bacon Burger set. 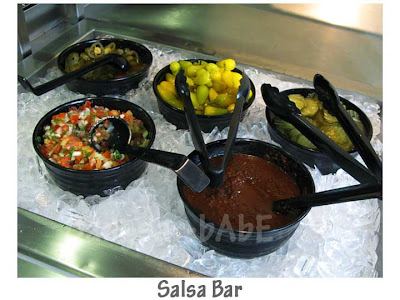 The salsa bar was better than the ones back home. Better choices and the salsa had kick! Awesome with fresh fries. 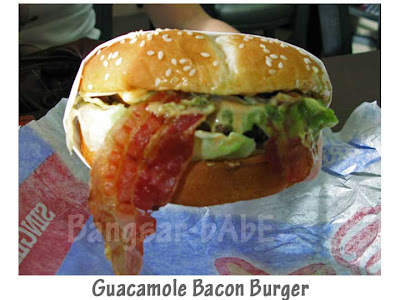 Carl’s Jr. Guacamole Bacon Burger consists of a beef patty, guacamole, two strips of PORK bacon, melted pepper jack cheese, onions, tomatoes, and lettuce on a toasted sesame seed bun. While the patty didn’t have a lovely pink center or as much juice as thicker patties do, it was tender and oozing with beefy, fatty flavour. The guacamole gave more tang to the burger, without overpowering the other ingredients. 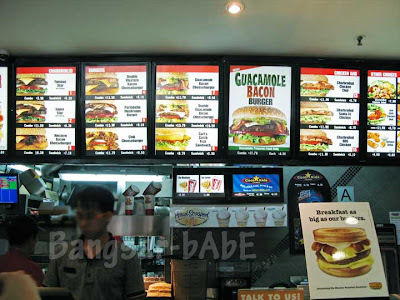 For SGD11.70 a set, it’s cheaper than Carl’s Jr in KL (dollar to dollar), where a set can cost between RM18 – RM30. 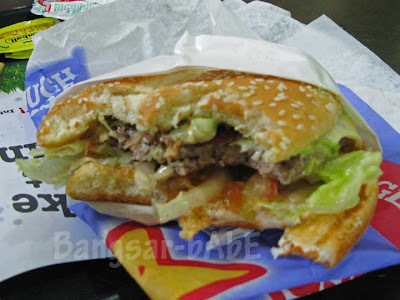 arggghhh we want our pork burgers back here in msia! the last 1 i had was either home made or in bangkok! Why not try the pork burgers at Cristang Restaurant in Sec 8 PJ.. they have been gaining a pretty good following for their pork burgers which are freshly made daily and grilled upon order.